Pega Customer Service suggests a review of open service requests during customer interaction. This allows the Customer Service Representative (CSR) to address important open service cases that they need to discuss with the customer. You can configure the cases that you want to suggest for review using the Case Match rule. In Designer Studio, access the Records explorer. Click Decision > Case Match to display a list of instances. Click CAReviewServiceItems in the PegaAppCA ruleset and save it to your ruleset. Label - The case match record configuration name and description. Apply to - The class where the configuration is located. 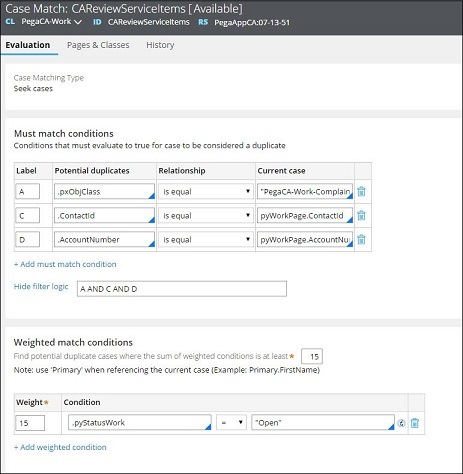 Navigate to to the Must match conditions section and enter the match conditions criteria that you want to use to match cases. In the example image in step 5, the Case Match rule looks for Open Complaint or Compliment service requests. In the Weighted match conditions section, enter the minimum weight value for finding duplicate cases. The default value is 15. Enter the conditions that you want to use to evaluate the work criteria for the resulting case match display. Before selecting a case, ensure that the combined score for the work item based on all conditions that you configured are greater than or equal to the value in the cutoff score field. The application configures the suggested review successfully.